There's no shortage of applications for the iPhone that can view documents and spreadsheets, but what's missing is a way to create or edit them. On top of that, with developments from the big name in PDA-style editing, Documents To Go, promising but not yet delivering on the iPhone, we were delighted to see the launch of Quickoffice. After forking out our £12 – pricey by iPhone-app standards – we fired it up. The interface is good, if a little clunky, and lacks the flair of the best applications from the likes of Tapbots. 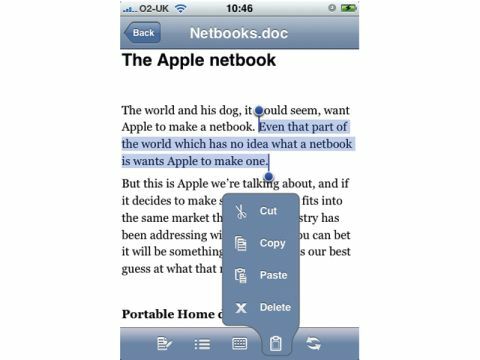 In the document editor, you can change fonts (limited to the iPhone's web-safe list), style and size, create bulleted lists and, by Jobs, can it be true… cut, copy and paste? The behaviour is a little fiddly, but it's bliss nevertheless. However, one problem is the keyboard's intelligence – auto-correction and the like – is missing, making typing laborious. The spreadsheet editor is basic, but it does let you enter and edit formulas, change cell formats and, of course, cut, copy and paste. You can also grab files from (and save to) your iDisk, or mount your iPhone over a WiFi network for direct copying from a Mac or PC. There's no way to open attachments sent by email, and while you can email files from the device or your iDisk, the system introduced odd formatting glitches.